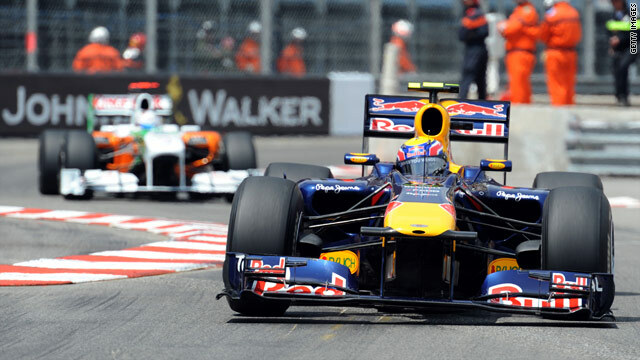 Mark Webber proved unstoppable in Monte Carlo to complete his second successive al-the-way victory. (CNN) -- Red Bull's Mark Webber has completed his second successive start-to-finish victory with a comprehensive triumph in the iconic Monaco Grand Prix. The Australian, who secured his first win of the season in Spain last weekend after starting from pole position, repeated that feat on Sunday around the narrow streets of Monte Carlo -- a victory that lifted him to the top of the world championship standings. In what proved to be a sensational weekend for the Red Bull team, who have started from pole in every one of the six races so far this season, teammate Sebastian Vettel followed Webber home in second position. Webber and Vettel are now locked together on 78 points but the Australian leads by virtue of having won two races, to the German's one, this season. "It feels absolutely incredible -- the greatest day of my life," Webber told reporters after his victory. To win here is a very special day. I did well in qualifying, but this place is such a test for two hours and I knew I had a lot of work to do. "To win here is a very special day. I did well in qualifying, but this place is such a test for two hours and I knew I had a lot of work to do. "We had lots of tests, safety cars, so it is a very satisfying win. I'm elated to join the likes of Ayrton Senna and those guys around here." Renault's Polish driver Robert Kubica maintained the qualifying form that saw him start in second place on the grid, by completing the podium in third position. However, it proved to be a disastrous race for world champion Jenson Button, who came into Monaco as overall leader in the drivers' standings. The Briton's McLaren suffered an engine failure on just the second lap, meaning he slides down to fourth place. Felipe Massa, Lewis Hamilton and Massa's Ferrari teammate Fernando Alonso completed the top six. Alonso produced a sensational drive to finish seventh, despite being forced to start from the pit lane after suffering a crash in final practice on Saturday morning. However, the Spaniard was promoted one place after Michael Schumacher -- who crossed the line sixth -- was handed a 20-second penalty after the race for illegally overtaking Alonso's Ferrari, demoting the seven-time world champion to 12th position and out of the points. That performance means the Spaniard is still firmly in the title race, just five points behind the Red Bull pair in third place overall.